Please upload a picture of Invulnerable form. Hostile Heartless, unlike White Mushrooms. They attack with poison. Defeating them may bring good things, but it is not easy. An aggressive, poisonous Heartless, not to be confused with the White Mushroom. The Black Fungus likes to paralyze its foes and toy with them. Tough-as-tacks Heartless that boost their Defense and produce puffs of poison when struck. Good luck defeating one—but lucky you if you do! Activate a random enemy card effect. 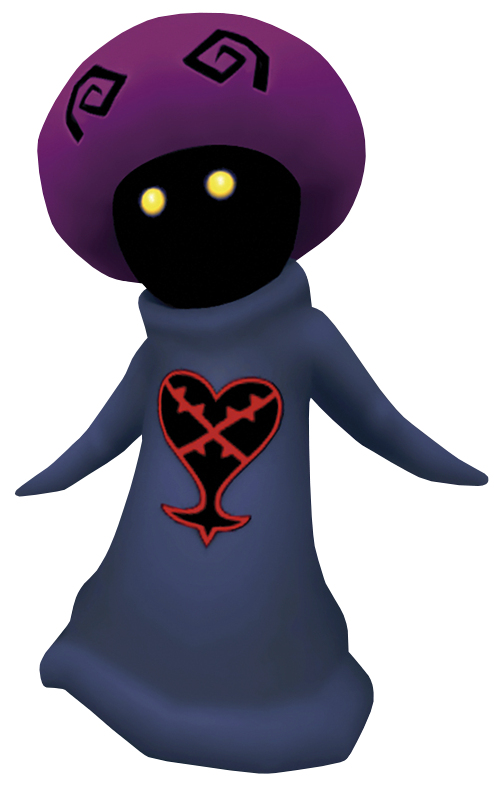 The Black Fungus is an Emblem Heartless found in Kingdom Hearts, Kingdom Hearts Chain of Memories, and Kingdom Hearts Re:coded. A Black Fungus has a spherical, pitch black head with two glowing yellow, beady eyes. It wears a round, purple cap on its head that sports two black, angular spirals on its front. It also seems to wear a navy blue smock that completely covers its legs and thin, fingerless arms. Its Heartless emblem is present on the front of this smock. The Black Fungus's name references its dark coloration, as well as Fungi, a biological kingdom that contains organisms such as mushrooms and truffles. Unlike the other Mushroom Heartless, it is very aggressive. It can become invulnerable for a short time to defend itself and release poisonous gases, making it very hard to defeat. If Sora finishes them off with a critical hit at the end of a combo, they may either drop a Mystery Goo (100%), or a Mystery Mold (10%). It is possible for them to drop both, and upon being finished with a Critical Hit, they drop around 20 to 100 Munny. If having trouble finding Mystery Mold after defeating a Black Fungus, use Trinity Limit. If Sora doesn't have Trinity Limit yet, use Gravity, as it is usually a one-hit knockout. Since the Black Fungus drop Mystery Mold after critical hits, make sure to remove all Combo Pluses before fighting them to shorten the length of the combo. In Kingdom Hearts Chain of Memories and Kingdom Hearts Re:Chain of Memories, the cards it uses are numbered 7, so be sure to break them accordingly. Defeating Black Fungi usually yields a Calm Bounty card (a Roulette Room card in Reverse/Rebirth), so exhausting Black Room cards is a rather easy way to stock up on Calm Bounty cards. This page was last edited on 1 May 2018, at 19:00.